Fans of Barbara Kingsolver will love this stunning debut novel from a New York Times bestselling nature writer, about an unforgettable young woman determined to make her way in the wilds of North Carolina, and the two men that will break her isolation open. For years, rumors of the "Marsh Girl" have haunted Barkley Cove, a quiet town on the North Carolina coast. She's barefoot and wild; unfit for polite society. So in late 1969, when handsome Chase Andrews is found dead, the locals immediately suspect Kya Clark. But Kya is not what they say. Abandoned at age ten, she has survived on her own in the marsh that she calls home. A born naturalist with just one day of school, she takes life lessons from the land, learning from the false signals of fireflies the real way of this world. But while she could have lived in solitude forever, the time comes when she yearns to be touched and loved. Drawn to two young men from town, who are each intrigued by her wild beauty, Kya opens herself to a new and startling world--until the unthinkable happens. 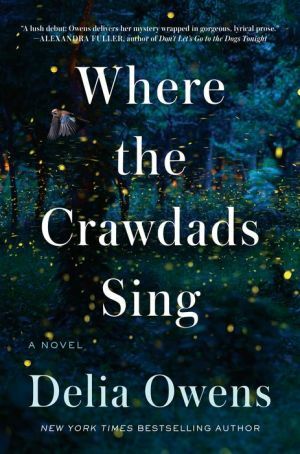 In WHERE THE CRAWDADS SING, Owens juxtaposes an exquisite ode to the natural world against a heartbreaking coming of age story and a surprising murder investigation. Thought-provoking, wise, and deeply moving, Owens's debut novel reminds us that we are forever shaped by the children we once were, and that we are all subject to the beautiful and violent secrets that nature keeps. For me, this book was totally unexpected. I'm not sure what I was expecting when I picked it up, but it wasn't something magical, mysterious, ethereal and other-worldly like this book is. The first thing I noticed was the language. Ms. Owens' writing is absolutely breathtaking. The book is about a little girl who has been left alone by her family at the age of seven. Her family consisted of her and four siblings and her mother and father. Her mother was a fairy princess in Kya's eyes. She brightened up her family's lives in the lonely hardscrabble cabin they lived in which is located in the North Carolina low-country. But first her older siblings leave, and then her mother leaves, leaving Kya with her drunken and abusive father and her next older brother, Jody. Then Jody leaves after a final beating from his father. Then it's Kya and her father and eventually he leaves too. Kya is all alone in the cabin with only the marsh, and her beloved birds for company. And the marsh is a character in this book. Kya thinks of the marsh as her mother, and this somehow gives her strength to carry on all on her own. The world does intrude on Kya's solitude occasionally, but her experiences with the outside world are not happy ones, and that just makes her withdraw more. She is called the Marsh Girl by everyone around. Kya learns to read and study her beloved marsh and all the life within it. It becomes her family. This is a coming-of-age story like none you have ever read. It's a haunting and sad story of a little girl who grows up all on her own in her beloved marsh. It's a story about a little girl who grows into a strong, capable woman. A woman who makes her own choices and lives life the way that she wants to until tragedy occurs in her marsh. Then the outside world comes crashing into Kya's idyllic and remote home. Kya's story is told in such lushly descriptive language that it felt almost decadent reading her enthralling story. Highly recommended.